Reza Aslan is an internationally acclaimed American writer and scholar of religions and author, most recently, of the Zealot: The Life and Times of Jesus of Nazareth. Dr. Aslan is also the founder ofAslan Media, an online journal for news and entertainment about the Middle East and the world, and co-founder and Chief Creative Officer of BoomGen Studios, an entertainment brand for creative content from and about the Greater Middle East. Dr. Aslan is also a member of the Los Angeles Institute for the Humanities and the Pacific Council on International Policy. His first book was the International Bestseller, No god but God: The Origins, Evolution, and Future of Islam, which was translated into thirteen languages, and named one of the 100 most important books of the last decade. Born in Iran, Dr. Aslan lives in Los Angeles, where he is Associate Professor of Creative Writing and Cooperating Faculty in the Department of Religion at the University of California, Riverside. Foreign Policy Concepts spoke with Dr. Aslan to discuss his new book, Iran under President Rouhani, Islam, Perennial Philosophy, the current crisis in Syria and the Greater Middle East. 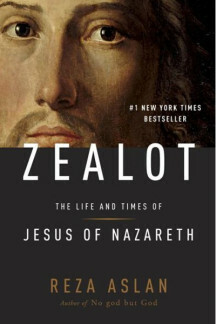 Before indulging ourselves in the geopolitics of the Middle East and the Islamic world, I’d like to start with your new book Zealot: The Life and Times of Jesus of Nazareth. What is the key premise of your book as it pertains to the character of Jesus? Are you drawing attention to, or even uncovering, certain aspects of Jesus, his life, and his social and political ideology that have gone unnoticed by many for a long time? And do you think it is your look at the Jesus as a person that has drawn criticism from certain circles? What I tried to do in my book was to place Jesus firmly within the cultural, religious, social, and political context of his time, which is something that I think most people don’t think about doing. Scholars have been doing this kind of work on the historical Jesus for two centuries, so, methodologically speaking, I’m not doing anything different than what people have been doing in this field for many many years, or that my conclusions aren’t that unfamiliar to those in the field of New Testament studies. But the fact is that a lot of these conclusions are unfamiliar to a broad general audience whose only exposure to Jesus is either through popular media or through church. The notion of trying to understand who Jesus was based on the world in which he lived seems like an obvious thing to do, but it’s something that is rarely done, because of the status he has in the mind of so many people as that of incarnate. After all, if Jesus is God, then his context is irrelevant; it makes no difference what the day and age of his world was. His words are universal, his teachings are universal. So I think that’s what sets this book apart. It’s an exploration of who Jesus was based on the time and place in which Jesus lived. It is certainly true that any book that seeks to examine Jesus solely as a human being is going to, just by definition, be problematic for billions of people who believe that Jesus is God. But the truth of the matter is that the core of Christianity is that Jesus was both God and a man. In other words, he was both things at once and too often the man part of Jesus’ identity gets lost in the God’s part for many Christians. You go to a church and what you mostly hear about is Jesus’ divine nature. Even when you do hear about Jesus’ human nature, it’s always under the guise of him also being God. They don’t get separated. I think it may come as a surprise to a lot of people to learn that the Christian response to my book has been overwhelmingly positive. Many Christians have told me that their faith has been empowered by my book even though they still believe that Jesus is incarnate, or son of God. They nevertheless appreciate having an exposure to Jesus as a real person, who lived in a real time, confronted real people and real issues. It’s something that is too often overlooked in Christianity. Let’s turn our attention to Islam. Is there a conflict between forces of traditionalism and those of rationalism within Islam? What, in your opinion, does it take for these forces to be reconciled as peacefully as possible? Does the turmoil in certain Muslim societies such as Egypt impact this debate as some in certain corners project it to be? First of all, it is important to know that the conflict in Egypt is not a religious one; it’s a political one. That projection is incorrect and incomplete. What we’re seeing in Egypt is not different interpretations of Islam in conflict with each other; on the contrary, what we’re seeing in Egypt is post-revolutionary interests at war with each other. And those interests go far beyond simple religious ideology. I think that is a far too simplistic a lens through which to understand the conflicts that are taking place throughout the post-Arab Spring countries. It’s certainly true that’s how popular media in the U.S. tends to paint it: one side is Islamists and one side is secularists, but that’s not what’s happening in Egypt. I think that’s a misguided view of that conflict. Insofar as the larger issue that goes beyond just conflicts of any particular country amongst what you refer to as traditionalists and rationalists, I think that conversation has been going on for centuries and it has to do very much along the lines of what I was saying about reading Jesus; that it has to do with how one approaches the Scripture. Does one believe that Scripture is a contextual thing? Was it revealed in a specific time and place to a specific audience? Is it historically contingent? If it is, then does it need to be constantly re-interpreted by successive generations of worshippers? This is something that Islam and Christianity, Judaism, and every scripturally based religion is constantly dealing with. The conflict between those who believe Scripture is inerrant and uncontextual, and those who believe Scripture may be divinely inspired but is nevertheless created in a specific time for a specific audience, is not limited to just Islam. What is your take on what is generally known as monopoly over the interpretation of the Scripture by an elite religious class (clerics) in a place like Iran and Saudi Arabia, where challenging the dominant interpretation of the Scripture can land you in jail or even cost your life? On Iran, let’s keep in mind that Shia Islam is a religion of argumentation and debate. All you have to do is just spend a few hours at Feyziye to understand that there is no one interpretation of Shia Islam. The control of the Supreme Leader in Iran is political, not religious. However, it’s true that in those cases, where there is the intersection of religion and politics with regard to—as an example, whether women should wear Hejab or not—that political or legal aspect is informed by the dominant religious view held by the Supreme Leader. But insofar as doctrinal issues are concerned, on the contrary, the conversation and debate among the Shia even in Iran is far more robust than you give credit for. Saudi Arabia is a different example altogether. Saudi Arabia is a theocratic regime. It’s a country without a constitution and, therefore, without any kind of firmly written laws. At the same time however, unlike Iran, where the clerics are directly in control of the political realm, that is not the case in Saudi Arabia. In Saudi Arabia the political realm controls the clerics. The religious authorities in Saudi Arabia are employees of the state; what they say and do is strictly controlled. Anyone who deviates from the accepted theological norms of the State is quickly and severely punished for it. So I think when talking about this region in any shape or form, there’s absolutely nothing that one can say that applies to multiple countries; each country is its own animal and has to be dealt with separately. To the larger point that you make, however, that those who maintain a far more traditionalist view about the Koran tend to be ascendant, is absolutely true across the board. And I would say that’s true regardless of what religion you’re talking about. Those who have a fundamentalist view of the Bible tend to be ascendant, as opposed to those who read it more historically and more contextually. This perhaps has more to do with the nature of religion and the fact that religious institutions tend to gravitate toward conservatism so, as a result, it’s the conservative voices that tend to hold sway. I’m not sure if that needs to be conflated with the lack of political rights in countries like Saudi Arabia and Iran, which is a real thing. There are no religious freedoms in these countries. I think that issue has to be dealt with separately from just lumping it in with this larger issue of this traditionalist dominance in Islam. Let me put it this way; the Saudi clerics disagree with every single word that comes out of the mouth of the Ayatollahs in Iran and vice versa. And they refer to each other as draconian and far too traditionalists and even heretical. The use of religion as state ideology is radically different in Iran and Saudi Arabia. I don’t think that anyone would question that there was a lack of expert knowledge about the native, religious, and ethnic traditions of Afghanistan, I’m not sure that that is a recipe for the failure of the NATO mission there. I think that Afghanistan, as many people have said in the past, is in some ways ungovernable. It is a mishmash of different ethnic and religious groups that has never had a truly firm sense of national cohesion. It is a place where empires from the Greeks to Britain to Russia to the United States have all found to be uncolonizable and unconquerable. So I don’t know if any amount of expertise or knowledge would have made the Afghan mission turn any differently. If there was a strategic mistake made in Afghanistan, it was abandoning the country and sending our resources to Iraq instead. Now in Iraq, there is an argument for how the lack of proper understanding of the ethnic, social, religious makeup of the country can lead to a disaster. But I’m not so sure if one can say with confidence that such a preparation, such an expertise and knowledge would have made the Afghan conflict turn out any differently. However, I think you could argue that it could have succeeded, given the enormity of the good will that not just the Afghan people, but the world and indeed Muslims in the Middle East had about the war in Afghanistan. People tend to forget this was a very popular war; one that even Iran was on the side of the United States. It was the removal of American troops, resources, forces, and might and its redirection towards Iraq that led to the disintegration of the Afghan war. But I understand the argument that some have made that no amount of preparation, no amount of military hardware or focus would have resulted in anything resembling victory in Afghanistan for the reason that I just mentioned above. The argument you’re making is most definitely true when it comes to Iraq. What potential do you think Perennial Philosophy holds for the process of de-radicalization of religious ideologies? Can it influence the emergence of a more moderate approach to social and cultural issues within Islam? I am struggling with the nature of this question. What you’re basically saying is if people have a far more liberal view, far more expansive and universal view of religion, would it lead to more progressive ideas about things like the role of women etc. then the answer is obviously it would. The question is: Is this even remotely realistic? I just don’t see how it is; I mean what you are referring to, that is Perennial Philosophy, is a very tiny minority view of religion of all religions; and one that is born of what I would say very high levels of education, very high levels of socio-economic status. So I think one can state with fair confidence that more religious people having this kind of perspective would be good. I just don’t’ see how realistic its influence would be. Religion does not tend toward liberalism and progressivism; it tends toward conservatism; the exact opposite. Perennial philosophy, coming from very elite segments of the society, does not have the appeal among the majority people of faith or of a particular religious tradition to have any kind of meaningful or significant impact. I think if you want to refer to something with a significant impact on the way people think about religion, or the way they think about other people’s religions, I think would be focusing on means of instilling a sense of pluralism in society; the notion that one can think their religion is the “right” religion, but nevertheless believe that other people should be allowed to worship as they wish. So that sense of pluralism is in my view more likely to embed itself in religious communities than the more universalist ideas that are offered by philosophies like Perennial Philosophy. Perhaps a day will come that in the very distant future these kinds of more universalist ideals will take root in religious communities, but until that time we should probably focus our energy on ideas that actually have the power to transform societies for the better. How would you characterize the key domestic and foreign policy challenges facing the administration of President Rouhani? Is Syria posing a dilemma to the Rouhani administration? I would say that by far the key domestic challenge for Rouhani is the crumbling Iranian economy. We’re talking about a country whose Rial has been devalued almost 80 percent in the last year; whose unofficial rate of inflation is about 24 percent; that has an unofficial unemployment rate of about 40 percent and indeed it is about four out of ten Iranians who currently live below Iran’s definition of the poverty line. Nonetheless the country is tasked with removing a hundred billion dollars in annual subsidies that have absolutely destroyed the Iranian economy at a time of international sanctions, because of Iran’s nuclear program, have completely dried up foreign investment, have collapsed the oil and gas infrastructure of the country. Rouhani has one job and one job only: to fix the economy. That’s the only thing he was elected to do; it’s the only thing that matters. Everything else including Syria and nuclear negotiations with the West is secondary to that single-minded task, because nothing else matters. Now one can argue that Rouhani’s chief foreign policy goal, which is to resolve the nuclear standoff with the West, is part and parcel of his economic agenda after all, unless he can figure out a way to ease international sanctions particularly on Iran’s oil and gas infrastructure, but also on its banking infrastructure, then there is really no amount of privatization, no amount of work that he does on Iran’s economy that would matter. Iran is still heavily indebted on its oil sales and it has to figure out a way to alleviate these international sanctions, if it wants to climb out of this economic catastrophe that it’s been placed under over the last two years. I think Rouhani has done a very good job of at least laying the ground work for those negotiations. I think his nuclear negotiating team looks like is going to be run by the new foreign minister, Zarif, which is the right choice. And should he be given the leeway necessary by the Supreme Leader to make the difficult decisions that would allow for an easing of the sanctions, I think he can hope for some success. Rohani has made the right moves and certainly those moves have to be reciprocated by the United States for them to matter. So that’s Rouhani’s chief domestic, and connected to it, its chief foreign policy challenge. The situation in Syria is, of course, not under his control. As you know foreign policy is not the purview of the president office; it is Supreme Leader’s and Iran has put itself in a bind by essentially marrying itself to the Assad regime, sending who knows how many millions of dollars in aid, in weapons, in training, to bring down the protesters and the insurrection against the government. In a way, Iran has made its bet and despite recent comments by the new administration in Iran trying to distance itself by condemning, for instance, Syria’s use of chemical weapon from the Assad regime. In a sense Iran’s fate is inextricably linked at this point to Assad’s fate, like it or not. So do you think the Iranians, being married to the Assad regime, would get involved in a military conflict with the U.S. should the U.S. attack Syria for its alleged use of chemical weapons? I don’t think they would get involved in the sense that they would directly engage the United States in a military conflict, but make no mistake that an aerial bombardment of Syria’s military infrastructure would be seen as an act of aggression on the part of Iran. Iran has troops on the ground in Syria. Then some of them would likely be killed as a result of any kind of planned aerial bombardment. I think the tightrope that Iran is going to have to walk is maintaining its support for the Assad regime, condemning what it termed as American aggression against a sovereign nation, while at the same time maintaining an open line of communication with the United States, trying as much as possible to divorce its nuclear negotiations from the engagement in Syria. Now whether it can do it or not remains to be seen, but the truth is that as much as Iran doesn’t want to conflate the two issues, neither does the United States. The United States does not have a desire to conflate the civil war in Syria with Iran’s nuclear program. It wants to keep those things separate. I could actually imagine a scenario wherein even as bombs are dropping on Damascus, negotiations with the United States continue moving forward unabated; I can imagine that happening. It’s possible to imagine Assad, as he gets bombed by the U.S. and its allies, do something spectacular against Israel, then his act against Israel would force a wholesale change of calculations by regional players. I think we can be fairly positive that should NATO begin an aerial bombardment of Syria, Syria would launch its missiles into northern Israel, that’s a given. Also, if Assad decides to launch chemical weapons against Israel, then obviously all the bets are off, then you’re talking about the real possibility of a regional war. But I think what you’ll really look at is similar to the 1991 war in Iraq in which the United States was able to convince Israel to stay out of it and try hard not to retaliate against the Scud missiles that were raining down on Israeli cities. Now by all accounts Syria’s missiles are far more reliable than Saddam’s were. And I can guarantee you that we have high-level conversations taking place right now with the Israeli Prime Minister and Defense Minister, making plans for that contingency because I don’t think anyone doubts that Syria is going to retaliate to any aerial bombardment by raining missiles down on Israel; I think everyone knows that it’s going to happen. But let’s remember Syria has gone to war with Israel three times and all three times was devastated as a result. It’s hard to know what Syria has in its arsenal, but the use of weapons of mass destruction would probably lead to a ground invasion of Syria. As I said, I think what we’re looking at is something along the lines of 1991. Is the Iranian ability to threaten Israel in the Levant region a key strategic imperative for Iran that it does not want to lose under any circumstances? For Iran, Hamas and Hezbollah are such strategic assets that had it not been for their ability to threaten Israel on behalf of Iran, Israel would have launched military strikes against Iran’s nuclear facilities years ago. It would be much more difficult for Iran to have the ability to threaten Israel in the Levant, if there was not a Syrian regime friendly to Iran. Syria is the primary transit route for Iranian weapons and money flowing to Hezbollah. Take away that transit route and in many ways you’ve cut Iran and Hezbollah off from each other. Iran can still maintain fairly close ties with Hamas through its proxies in the Sinai in Egypt, for example, but it would be very difficult to maintain the same sort of connection that it has with Hezbollah. I would say that there is a tendency in many foreign policy circles to view Iran’s actions as irrational, to say that it supports terror organizations, but Iran is as rational a state as it gets. I mean this is a country that has managed to survive more than three decades in a hostile neighborhood with a hostile population that is not very fond of its government, and yet it has managed to make strategic decisions and form strategic alliances to allow it not just to survive, but frankly to become a regional power. These are actions of a very rational nation-state, not the actions of a bunch of crazed religious fanatics.